Kirsten Flynn is a Member of the International Committee. In this article, she speaks to Brendan Counsell, Fred Rowley and Nicolette Rubinsztein about their involvement with the IAA and reflections on the recent IAA meeting in Berlin. Twice a year the Council and Committee of the International Actuarial Association (IAA) meet in various regions of the world. In the past five years, meetings have taken place in the USA, Hungary, South Africa, Russia, Canada, Switzerland, the UK, Singapore and the Netherlands. The latest meeting was held in Berlin, Germany over 30 May to 3 June 2018 and 332 delegates were in attendance, including 14 from Australia. These meetings provide an opportunity to discuss ongoing projects and consider new developments as well as to network and collaborate. 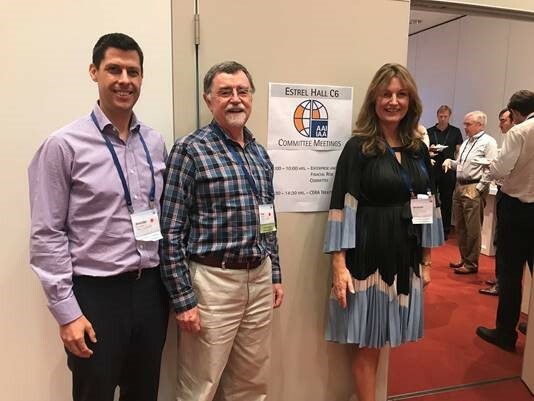 Kirsten Flynn recently caught up with 3 of the Australian delegates – Brendan Counsell, Fred Rowley & Nicolette Rubinsztein – about their involvement with the IAA and the Berlin IAA meeting. For more information about the IAA, including information about Council and Committee meetings, visit actuaries.org. How and why did you come to represent the Australian actuarial profession at IAA meetings? 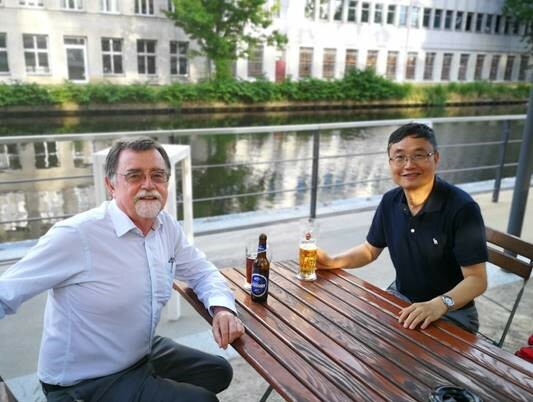 N: I went to Berlin in my capacity as Senior Vice President of the Actuaries Institute. My main aim was to learn from what other actuarial associations are doing around the globe and bring back some best practice ideas to Australia. B: For a number of years now, I have been involved in local industry working groups covering the new accounting standard for insurance contracts, IFRS 17. There was an opportunity to join the IAA’s working group on the topic, the Insurance Accounting Committee, or IAC, so I volunteered. Because IFRS 17 is a global accounting standard that affects Australia, I think it’s important that Australian actuaries and accountants have a seat on the various international bodies so that we can influence interpretations and emerging practice. F: I started to contribute to a few IAA discussions on technical topics in the 1990’s. The Australian profession’s pioneering experience (in some areas) and ‘can do’ approach seemed to give opportunities to promote progressive ideas that hadn’t been tried elsewhere in the world. When I was President of the Institute in 2007, I saw a much greater range of opportunities to influence the leadership of the profession globally – in ways that would support their collective goals and our local goals at the same time. The global CERA (Chartered Enterprise Risk Actuary) credential came out of one of those opportunities. Why do you think it’s important for the Australian actuarial profession to be represented at IAA meetings? F: We can contribute a lot to the development and influence of the profession at the global level – and the development of the industries we serve – in a way that benefits our members directly. We have always been thought-leaders in our region, and sometimes globally. I think of the Actuarial Control Cycle, and pioneering realistic accounting for insurers. We can use our insights to influence the direction of global developments, for the greater good. But at the same time we can learn a lot from others, and work together with parts of the profession around the world, wherever we have common interests. 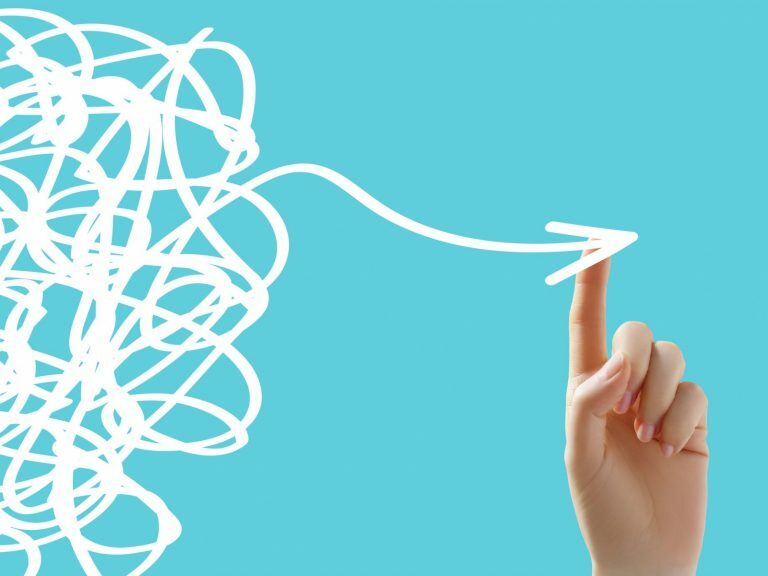 If you don’t know what they’re doing, you can’t work together – and you can’t compete either! B: The ability to influence debate and emerging practice is very important e.g. for IFRS 17. If you don’t attend and participate in the meetings then you can’t really complain if you don’t like the outcomes! Further, a wide range of ideas and thinking is brought to the meetings from around the world. By attending these meetings, we can leverage new ideas and improve the way we operate as a profession here in Australia. The IAA produces a lot of very good quality material on a wide range of topics that many of our members may not be aware of (you can find links to much of this by exploring actuaries.org). Which of the sessions you attended at the IAA meeting in Berlin were the most interesting and why? F: One committee I attended deals with Insurance Regulation at the global level. 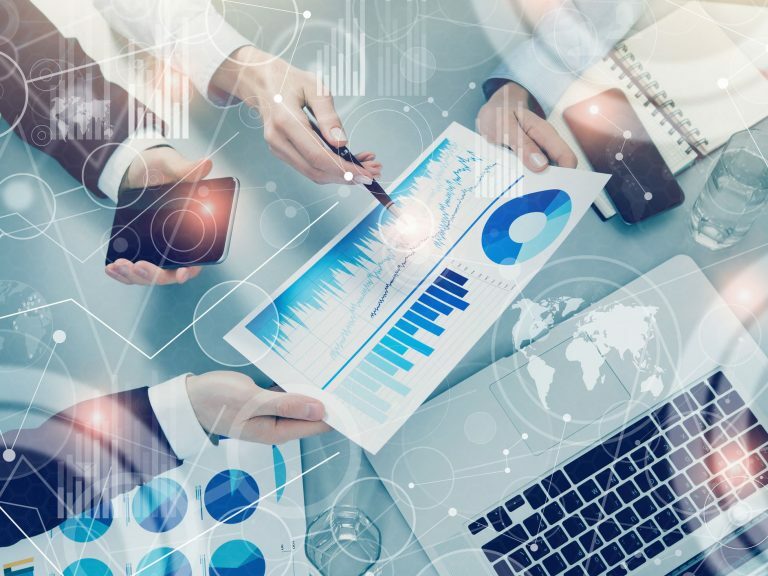 We are in the process of contributing to the design and development of international frameworks for insurance regulation, which means promoting better ERM and more consistent capital management. The ultimate ‘customer’ for this work is actually the G20 group, although it is being driven operationally by the International Association of Insurance Supervisors (IAIS). Its goal is to improve the stability of world economies by enhancing the supervision of financial institutions that operate globally. B: Being new to the IAA meetings, I found the most interesting sessions to be the Presidential Town Hall on the opening day, and the Council meeting on the closing day. Both of these sessions provided me, as a newcomer, a good overview of what the IAA does, their membership and some of the key challenges facing actuaries as a global profession. For example, did you know that the IAA has around 100 member associations from around the world, but 60% of their funding comes from the three largest associations? However, the smaller associations obviously have a lot to gain from membership of the IAA and make up the remaining 40%. So, while the large associations are big stakeholders, the IAA must also remain relevant and accessible to all of the smaller associations, including ours! Impact of climate change on mortality. What issues were discussed that are most relevant to the Australian actuarial profession? B: Some of the challenges that the IAA is grappling with are also very relevant to the Australian profession. Two key challenges for the IAA that are also relevant here are 1) how we communicate and publicise all the good work and thought leadership that we are doing and make it accessible to a wider audience and 2) how do we best make use of our limited, mostly volunteer, resources in an efficient way that focuses on the topics that are most relevant and useful to the profession and wider society? F: I also attended the Banking Working Group. The South African Association (ASSA) and the UK are both strong in this area and are leading the work on a possible syllabus for Banking as a specialist exam. It’s probably safe to say that Banking practice around the world is more uniform than insurance practice. As a result, the syllabus work has the potential to rapidly expand the capabilities of the profession in Australia, without re-inventing the wheel. The approach to CPD varies a lot between countries. Many are leveraging technology to create a platform and easier user interface for members. Some are requiring specific CPD hours for professionalism. What are some of the things you did with your free time in Berlin? B: I bumped into a few of my EY colleagues from other parts of the globe (networking is a good reason to attend these meetings!). I joined one of my colleagues from the EY Amsterdam office on a bike tour around the city and visited all the tourist traps – it was good fun. Being from Amsterdam he spoke a bit of German and was familiar with Berlin, so I was lucky to have a “semi-local” guide. F: When you’ve travelled so far, the opportunity to catch up with overseas actuarial friends – old and new – is irresistible. So I spent a lot of time with them – talking about a range of things while we enjoyed the boat tour of the city, or admired the wonderful museums. I also took some time out to visit a few memorials to those who have suffered in the past to defend (or just for trying to enjoy) our democratic freedoms. It was sobering to reflect on what they went through, and why. And on a more cheerful note, I also met up with my nephew, who is lucky enough to live and study there! N: Berlin is a city with a great energy. 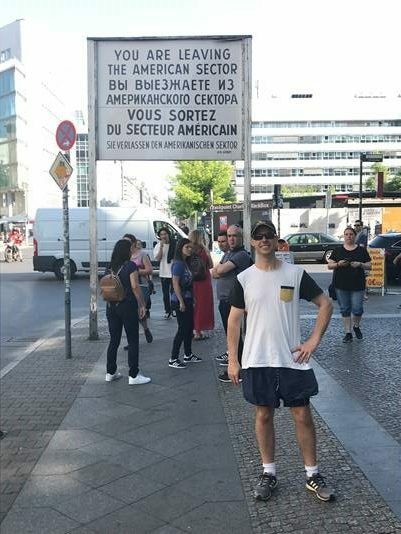 I had breakfast on a rooftop terrace in one of the trendy areas, wandered the streets of Mitte, went to the Stasi museum, went to Checkpoint Charlie, visited KaDeWe department store (which has survived the highs and lows of German history). I also ate out at some great restaurants and was very happy that vegetarians were well catered for – as I was expecting a lot of sausages to be on offer! Brendan Counsell is a partner in the actuarial practice at EY based in Sydney. Fred Rowley is a consultant with PFS Consulting in Sydney – mainly dealing with strategy and risk management questions for life insurance business. He was President of the Actuaries Institute in 2007 and President of the International Actuarial Association in 2015.